With great interest we read the article of Taylor et al in the Journal of Clinical Pathology regarding the use of guaiac faecal occult blood test (gFOBT) cards for microbiome studies.1 gFOBT cards were found to be an easy to use option for stool collection and gained results comparable to fresh stool, even when cards were stored for up to 3 years at ambient temperature before DNA extraction. We would like to share our experience that even after 10 years of storage, gFOBT cards and faecal immunochemical test (FIT) tubes can be used to study the microbiome. Taylor et al conducted 16S rDNA amplicon sequencing for determination of outcome comparability within and between sample type and storage time.1 Between-subject differences greatly outweighed any differences by sample collection type (fresh vs gFOBT) and time spent at ambient temperature (from 2 weeks up to 3 years after development of the gFOBT cards), which was also reported previously.2–4 No appreciable differences within the three individuals with regard to microbial taxa composition, alpha and beta diversity index and intraclass correlation (ICC) were observed.1 In our analysis, we used gFOBT cards (Hemoccult II; Beckman Coulter) and FIT tubes (OC-sensor; Eiken Chemical) that were collected a decade ago to evaluate the positive predictive value and specificity of these tests in a colorectal cancer screening population.5 Storage times at ambient temperature ranged from 2 to 11 days before samples were developed and frozen at −80°C for long-term storage. From 5 FIT tubes and 12 gFOBT cards DNA was extracted with a protocol adjusted from the Human Microbiome Project including bead beating (see online supplementary file 1). DNA quantity and quality from these 10-year-old samples were evaluated and analysed with quantitative PCR (qPCR) for the most abundant phyla in stool. FIT tubes that were stored for 2–4 days at ambient temperature had DNA yields between 260 and 1170 ng and all had good quality, long fragment size DNA (5–12 kilobase pairs (kbp)). The DNA yield for gFOBT cards that were immediately developed on arrival was considerably higher ranging from 1000 to 4430 ng compared with tests that were at ambient temperature for 5–11 days before development (90–520 ng DNA total) (table 1). From the 12 gFOBT cards, seven had considerable medium to good quality DNA (fragment sizes between 2 and 12 kbp). Five samples that were all stored for more than 1 week had low-quality DNA (fragment sizes <0.5 kbp) or degraded DNA (table 1 and figure 1A). (A) One per cent agarose gel showing DNA fragment sizes of DNA isolated from faecal immunochemical test (FIT) tubes (OC-sensor) and guaiac faecal occult blood test (gFOBT) cards (Hemoccult II). (B) DNA isolated from OC-sensor (FIT tubes) and Hemoccult II (gFOBT cards) was subjected to qPCR. The efficiency of each individual primer pair was used to calculate relative quantities (see online supplementary file 1). Ratios for each bacterial phylum (target gene) relative to all 16S rDNA (reference gene) were calculated in reference to a stool sample that was immediately frozen at −80°C (reference sample). This stool sample was used as internal control in all qPCR plates to control for variation between plates. 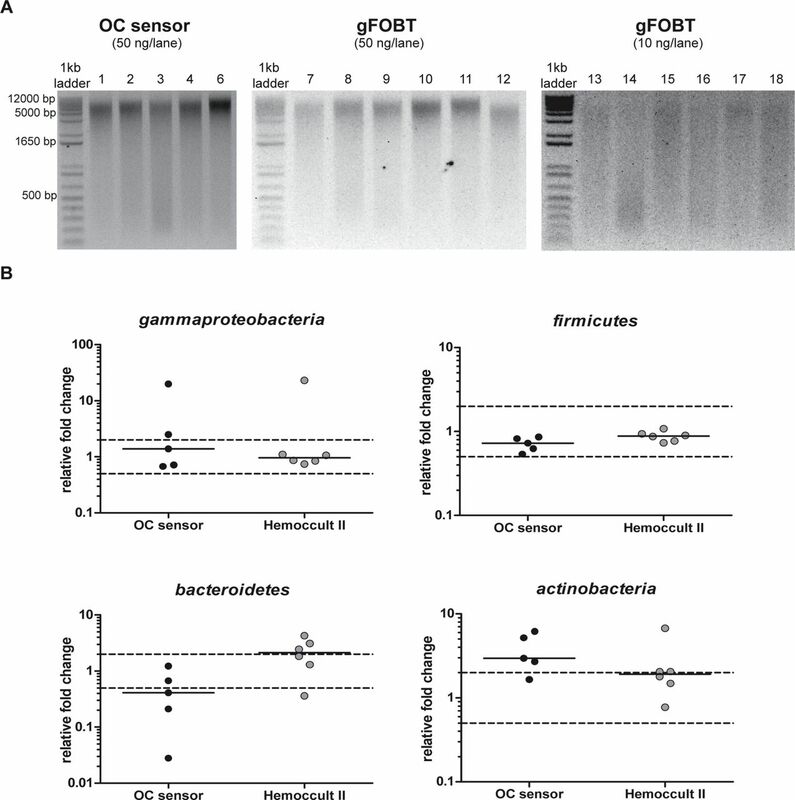 Compared with the reference sample, OC-sensor and Hemoccult II cards had similar ratios (within dotted lines (less than twofold change)) for Gammaproteobacteria and Firmicutes. For the OC-sensor test, three out of five samples had ratios outside the twofold range for Bacteroidetes and four out of five samples for Actinobacteria. Comparing OC-sensor with Hemoccult II, Bacteroidetes were significantly more abundant in Hemoccult II tests compared with OC-sensor (Mann-Whitney U-test; p=0.0303). Next, DNA was subjected to 16S rDNA qPCR for universal bacteria, Actinobacteria, Bacteroidetes, Firmicutes and Gammaproteobacteria. FIT tubes and gFOBT cards had similar relative quantities (RQs; between 0.5 and 2.0) as immediately frozen reference stool for Gammaproteobacteria (median 1.32 and 0.94, respectively) and Firmicutes (median 0.74 and 0.90, respectively; figure 1B). For Bacteroidetes and Actinobacteria, FIT tubes seemed to have a decreased presence of Bacteroidetes in three out of five samples (RQ<0.5) and an increased presence of Actinobacteria in four out of five samples (RQ>2) compared with the reference sample. Unfortunately, we could not compare the test results with their own fresh frozen stool as this was not stored at the time. Therefore, differences relative to the reference sample could likely be due to between subject variations and we are unable to evaluate whether changes in microbiome composition occurred during storage. When comparing FIT tubes with gFOBT cards, there was no difference in RQ for Gammaproteobacteria, Firmicutes and Actinobacteria. Only Bacteroidetes were significantly more abundant in gFOBT cards compared with FIT tubes (p<0.05). Overall, DNA quantity and quality isolated from both tests are satisfactory for 16S rDNA qPCR evaluation with limited variation between samples. In general, qPCR is considered a more sensitive technique than 16S rDNA amplicon sequencing, and thus these data add to and support the findings by Taylor et al.1 More importantly, our analysis shows that even after 10 years of storage, gFOBT cards and FIT tubes can be used for microbiome analysis, unless storage at ambient temperature before development of gFOBT cards is not beyond 7 days. Recently, another study showed that storage at ambient temperature for 4 days before development of gFOBT cards resulted in a high ICC in observed operational taxonomic units (OTUs).6 The ICCs for FIT and gFOBT at phyla level were high for Actinobacteria (0.90 and 0.90, respectively) and slightly lower for Bacteroidetes (0.81 and 0.68, respectively) and Firmicutes (0.78 and 0.71, respectively). Genus level concordance was high across the board; the median ICC for 26 genera observed was 0.88 for FIT tubes and 0.92 for gFOBT cards. This shows that short differences between assay development and storage at −80°C do not greatly affect results. Taylor et al showed that storage of the gFOBT cards for 3 years at ambient temperature after development did not result in appreciable differences in outcome. Therefore, the DNA on gFOBT cards is relatively stable after development and could be stored at room temperature. We show that storage longer than 7 days before development of the test results in significant DNA fragmentation and degradation. Therefore, it would be advisable to develop gFOBT cards as soon as possible after collection to preserve them for microbiome studies. Especially temperature fluctuations and freeze thaw cycles render a sample susceptible to compositional changes.2 Each stabiliser (including freezing) results in changes in relative abundance.7 No stabilisation at ambient temperature results in changes in microbial composition after 12–24 hours, favouring outgrowth of more oxygen tolerable microbes and deviates significantly from the ‘real’ microbiome composition (fresh stool).8 With regard to technical reproducibility, stability and accuracy, each study should use the same collection method, storage conditions and DNA isolation protocol to limit technical variations. DNA quality and quantity also depends substantially on the DNA extraction method used (see online supplementary file 1) and we advise the use of a method including bead beating and removal of faecal PCR inhibitors to warrant DNA quality and an accurate representation of all microbial phyla in the DNA extract. In conclusion, gFOBT cards and FIT tubes are acceptable stabilisers for microbiome analysis, even after 10 years of storage. This has a tremendous impact as large collections can be used for retrospective analysis and it opens doors for future clinical research in relation to bowel diseases. More importantly, the use of gFOBT cards and FIT tubes allows for the integration of microbiome-based diagnostic approaches in colorectal cancer screening without the need of additional sample collection. Contributors MCFA performed all the experimental work, data analysis and wrote the letter; YvH selected cases, gathered gFOBT cards and FIT tubes for analysis and critical evaluation of the results; GAMK performed experimental work for DNA optimisation methods and critical evaluation of the results; BED was responsible for critical evaluation of the work; TB is responsible for study design and case selection for analysis; AB designed the study, selected cases, analysed the data, supervision of experimental work, writing of the letter. Funding Annemarie Boleij is funded by the Dutch scientific organisation (NWO; Veni-scheme grant no. 016.166.089). Ethics approval The study was ethically reviewed and approved by the Dutch Health Council (2005/03WBO, The Hague, The Netherlands) as described in van Rossum et al 2008. The use of gFOBT and FIT tests for this study was in accordance with the ‘Dutch Data Protection Act’ and ‘the Code of conduct for responsible use of body material’. All samples were coded and stored without any items that could lead to identification of the subject.